People with flags kept passing by us. Not just Lithuanian flags, which would be slightly more expected given that I was in Vilnius, but also Estonian and Latvian flags. Then it dawned: it was August 23, 2014, the 25th anniversary of Baltic Chain. 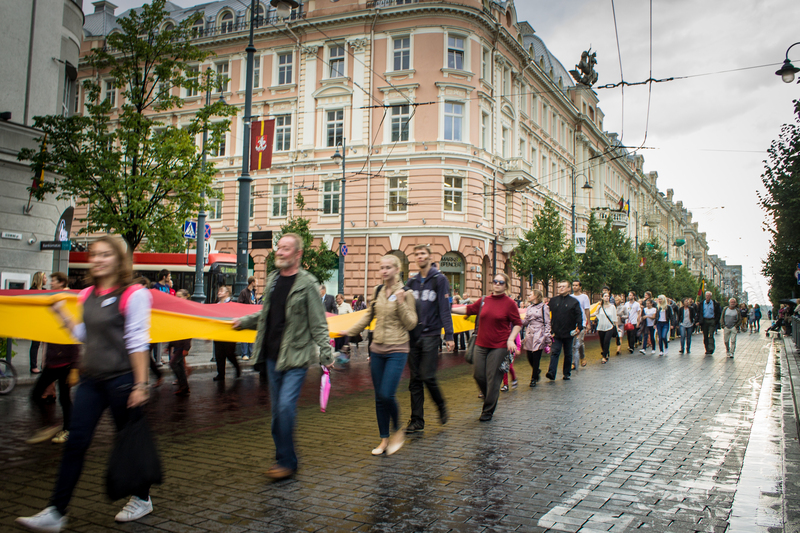 Evelina and I walked to Cathedral Square and were surrounded by people mulling about with flags in hand and television crews zipping around. A stage had been set up for events later in the day. On August 23, 1989, approximately two million people across the three Baltic states joined hands, forming a chain from Vilnius, through Riga, to Tallinn, a distance of over 400 miles (about 675 kilometers). This was a peaceful protest against Soviet rule of the Baltics and was strategically held exactly 50 years after the Molotov-Ribbentrop Pact was signed between the Soviet Union and Germany, effectively leading to the Soviet occupation of these three countries. 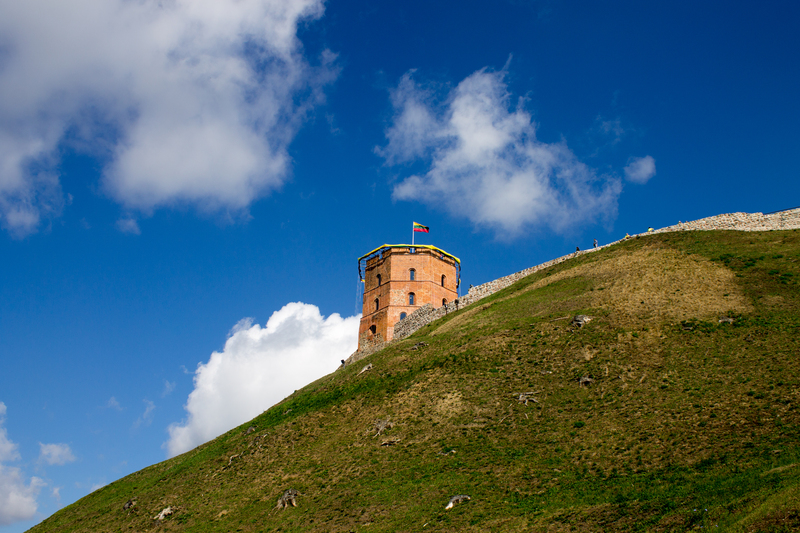 Seven months after Baltic Chain, Lithuania became the first Soviet republic to declare its independence. Celebrating the 25th anniversary of Baltic Chain on Cathedral Square. I had been really curious to sense the political atmosphere in the Baltic countries, especially given that I was traveling from Russia and conflict in Ukraine was ongoing. 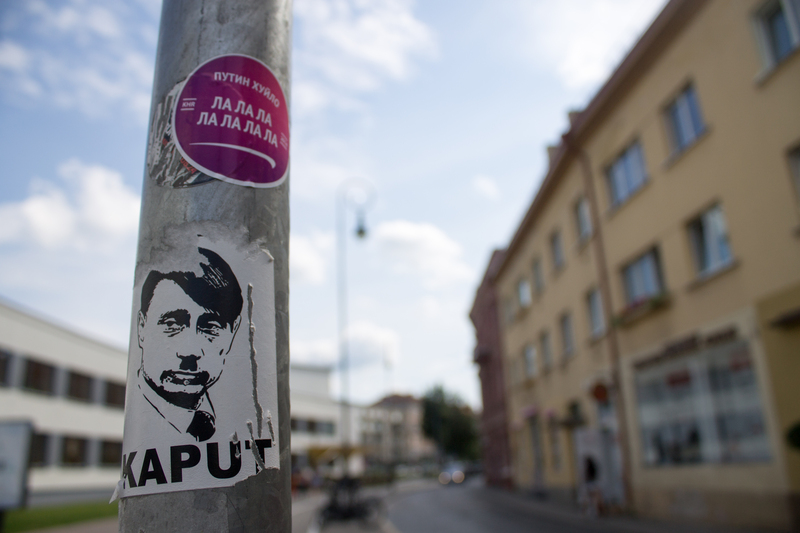 I didn’t have to look too hard to see how many Lithuanians felt—that is, angry and wary. Eve told me it was wiser to speak English to people first and then switch to Russian if English didn’t work. Not that people would be mean (in fact, I saw people very kindly helping Russian tourists), but they might be more at ease with me if they realized I was, in fact, not Russian (though I’m pretty sure my Russian alone would give that away). To add to anti-Russia sentiment, on August 22, it was announced that a Lithuanian diplomat had been kidnapped and killed by separatist rebels in the Ukrainian city of Luhansk. I noticed that flags around town began to wear black ribbons on their posts. Wandering around Cathedral Square were mainly older and middle-aged people, though not exclusively. These people are old enough to remember, and perhaps even participated in, Baltic Chain. The mood enveloping the square was quite jovial. They had run out of flags to give away, but a nice woman gave me a Baltic Chain anniversary sticker instead. After taking in the pleasant scene, Eve and I decided to walk elsewhere for a bit. Even just strolling the streets, however, demonstrated the general political sentiment. 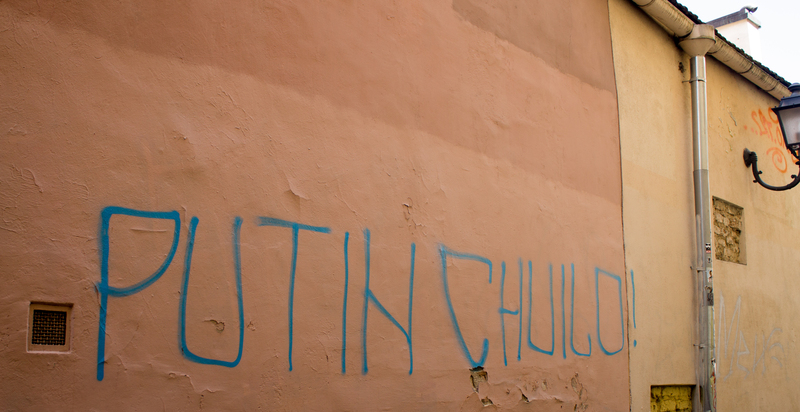 I came across multiple instances of declarations declaring Putin huilo, a cursing expression about Putin that has become popular. The past or present political situations don’t cast a gloomy shroud—for I found all three Baltic countries to be the opposite—but there is a certain glint, a need to demonstrate one’s autonomy. The fact is, many countries on the western border with Russia are uneasy. I saw this and conversed about it in Lithuania, Latvia, and Estonia. Even the larger (thought certainly not large) Finland is uncomfortable, especially given recent Russian incursions into its airspace. And of course, the United States’, my native and home country, relations with Russia are increasingly deteriorating. Prior to visiting Russia, I was bombarded with well-meaning concerns from family and friends. I was very isolated during my incredible time volunteering in Siberia with Great Baikal Trail, but I experienced absolutely no hostility even when I emerged from the forest and was in Irkutsk or Moscow. However, I did receive my first ever warning from the U.S. State Department, alerting Americans about an upcoming demonstration in Moscow in support of Novorossiya (a separated East Ukraine), where there would likely be ample anti-American sentiment. In the Baltic countries, it all flipped. Eve and I left an afternoon film screening and ran into another Baltic Chain event in the drizzling rain. People paraded by carrying an enormous, very long flag that stretched out further than I could see as it was carried down the street. We watched it all file by, and then we went for dinner, me pestering Eve with questions all the while. As fellow post-Soviet states, the Baltics feel different from Russia. Extremely so. And now, especially, during these political and humanitarian crises, people are making their feelings known and national pride is almost inextricably entwined with anti-Russia (as a political power) sentiments. There is also a solidarity that emerges, as it did during Baltic Chain. Lest anyone confuse things, the three Baltic countries are different from one another. They speak different languages (and Estonian is in fact in a separate language group from Latvian and Lithuanian) and have different cultures and histories, though much of their recent histories are somewhat shared. Yet, the significance of the Baltic Chain anniversary and the active celebration of all three countries during the celebrations in Vilnius, shows that these shared feelings breed some sense of unity. That night, Eve and I went out to a party. The drizzle had stopped, but was replaced by a damp chill. Dancing cleared away any lingering bone cold, and once we were tired, we decided to venture to Cathedral Square again, for Eve had seen a friend’s photo of Gediminas’ Tower of the upper castle in Vilnius on the hill beside draped in Baltic flags. We did not expect that the celebration would be continuing so late, however, for by now it was after midnight. Music swelled from the square and a crowd had gathered around the stage, which was currently occupied by a Lithuanian rap group. Simultaneously amused and inspired, we stepped around candles and made our way into the crowd. The rap group finished and the announcer took the stage. In solidarity with Ukraine, they pronounced, the final performance would be by Ruslana, a Ukrainian Eurovision-winning musician and political activist. She belted out a Ukrainian folk song with the blue and yellow flag draped around her shoulders. 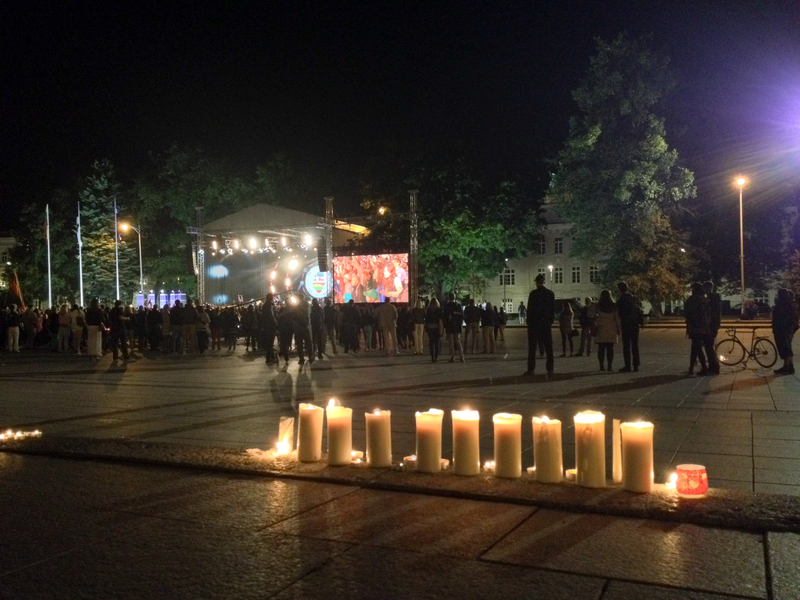 And thus, Baltic Chain anniversary celebrations in Vilnius concluded on a note that recognized that, though the results the Baltic independence movements desired were achieved, history is not over. Eve and I gazed at the tower, wrapped around in the Estonian, Latvian, and Lithuanian flags merged together, and then made our way home. The melody of the Baltic Chain song, whose words I did not know, remained in my head. Marching with the very long flag. The Baltic Chain anniversary concert. The next morning I boarded a four-hour train to Klaipėda. A sixty-year old woman named Danute sat down next to me and we struck up conversation in Russian, our common language, for she didn’t speak English and I don’t know Lithuanian. As trees flicked by the window, she asked me about myself and told me about her niece living in California and her brother who she was visiting in Klaipėda. She asked me if I went to the Baltic Chain celebrations the night before and I told her that, yes, I had been to part. “I was there, those years ago,” she told me. In between offering me coffee, she described the day. Even people in villages far from the Chain stood outside as their way of taking part. Danute smiled, her excitement still present. She told me that planes flew overhead, and they dropped down flowers. Thanks, Tara! To be honest, I had only a vague idea about Baltic Chain and the Baltic independence movements before visiting and learning more. What were you doing in the Chinese wilderness? This is the first I have learned of the Baltic Chain, too. Thank you for sharing its history and anniversary with us. It’s so nice to read that the Baltic states are united in remembering this historic event. I was in Finland earlier this month and, based on what I read in the news, agree that there is a certain level of discomfort in the country these days. Thanks, I’m glad you enjoyed learning about it (as did I)! It’s great you were in Finland, which is one of my favorite places. I guess you were there not long after I was! Haha, me too. :) I’ll watch for your posts! 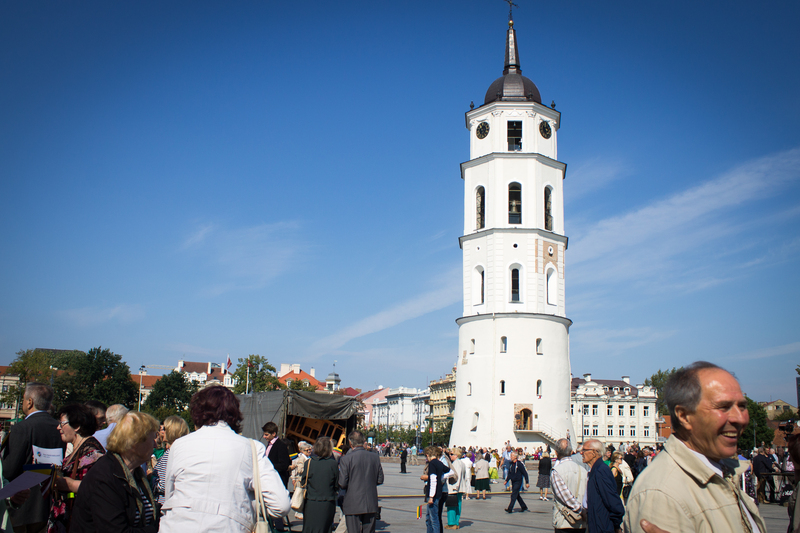 Baltic Chain tour is one of most historical event that celebrated at August 23 every year. The events attract global attentions of world. I a big crowed of people took part in it. I never had experience to join this crowed but having little bit knowledge about it and after reading your post my knowledge has been increased good job keep it up. I’m glad you learned something. Thanks! Still waiting for your full and complete rebuttal of Russian soldiers in Ukrainian territory. I particularly like the video of the Russian soldiers claiming at first that they are Ukrainian, then admitting they are Russian. and then the video of Putin admitting the same.